1. 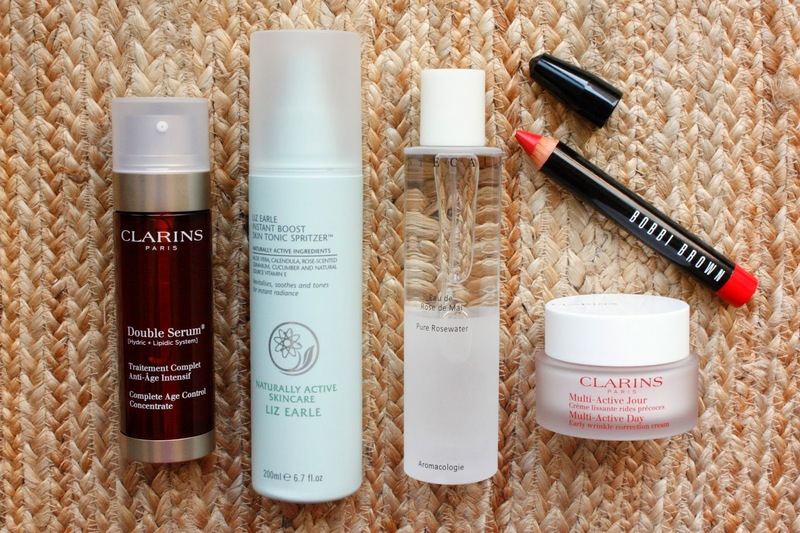 Clarins Double Serum* - This is one of Clarins' best sellers and I can see why. They advise it for any age and skin type, and I love products like that. For me, I find that I enjoy using it in the morning before the Multi Active Day moisturizer. It is designed to help firm, retexturize, and decrease the appearance of pores - for me that translates to helping perfect my skin. I love the feel of the serum as it sinks in immediately and wears well under my makeup. Morning makeup time got even better (which I didn't even think was possible). Now if only I didn't have to get up so early. 2. Liz Earle Instant Boost Skin Tonic Spritzer* - Two mists in one favorites post? YES. Mist me now. Mist me later. Mist me FOREVER. And this one does exactly what it says - boost! It's like a pick me up for the skin. I have been adding to my morning routine because that is when I need things to perk up and look alive (now if only there was one for my body and mind). I'm already a huge fan of this Liz Earle product (it's on my holy grail list), so I am happy to experience another product from the line. I prefer it before makeup rather than post, and apply after cleansing. 3. Chantecaille Pure Rosewater* - Oh my goodness - I don't know what I like more - using this product or staring at it. Housed in a chic glass bottle, this is pure rosewater, hence the name. Pure heaven and bliss for the skin, this mist helps to calm and hydrate my skin anywhere, anytime, makeup or bare faced. I recently got over a cold, and this mist was a saving grace for my skin. 4. 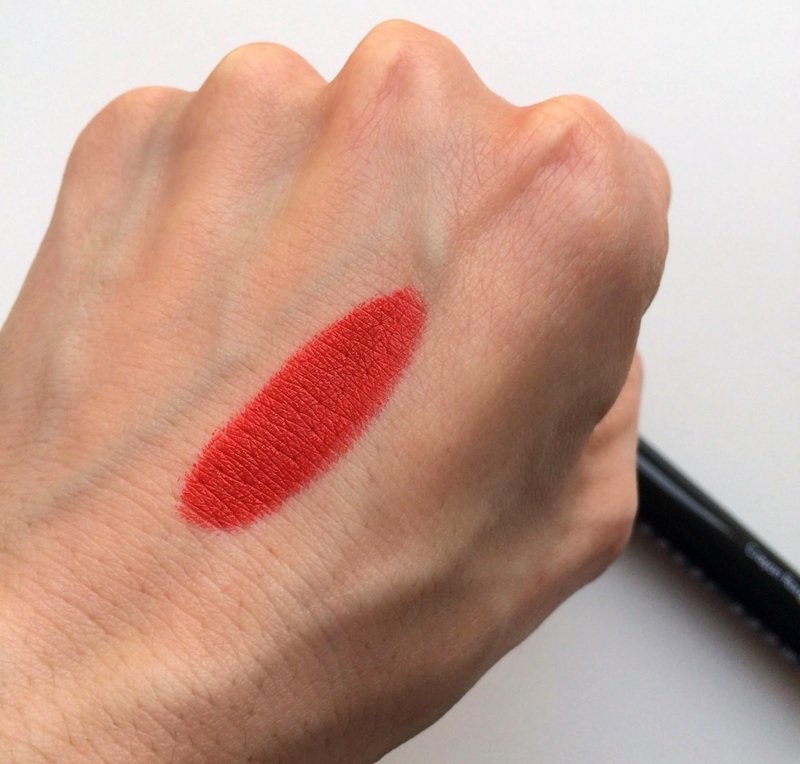 Bobbi Brown Art Stick in Sunset Orange - Give me all the large lip pencils - they are so easy and fun to use! I was immediately in love when I first saw the Art Sticks on display at Saks, and picked this vibrant orange red to come home with me. Though I love a bold lip color, what drew me most to this shade was how wearable it was compared to other colors I have which can be too "in your face". There are times when I want a sophisticated strong lip that enhances my look rather than consume it. Oh, and no one, and I mean NO ONE does matte lip colors like Bobbi Brown. They are never drying, last forever and feel like a dream on the lips. This Art Stick in Sunset Orange is no exception. 5. Clarins Multi Active Day Cream* - Yes - another addition to my morning routine. Here was my previous routine, and now I am onto a whole new line up. I always love a skincare shake up. Another top seller for Clarins, this Multi Active Day Cream is suitable for all skin types and helps to address the first signs of aging. To be honest, I just like the way it feels on my face. I don't suffer from too many wrinkles yet, so I mainly love how soft and supple it makes my skin. Perfect for applying foundation. It does not have SPF so I always need to add that as a last step (this one and this one are two of my faves), but I think this will take me well into spring and the beginning of summer before I need to switch to a lotion formulation. The Bobbi Brown Art Sticks sound and look amazing. I have been eyeing them, but haven purchased any, yet.